DES MOINES, Iowa, April 9, 2019 /PRNewswire/ -- Love your furry friends? Want to make sure they live their best lives? 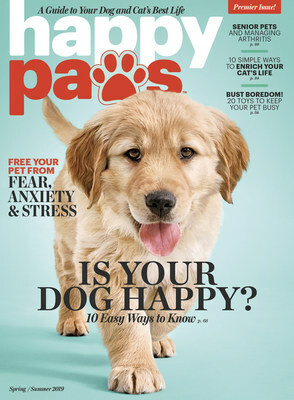 So does Happy Paws—a new publication from Meredith Corporation (NYSE: MDP) (meredith.com), the nation's largest brand-powered food, lifestyle and entertainment media company, and Fear Free, LLC, a veterinary, pet professional and pet owner education company—which is a guide to your dog and cat's best life. Written by veterinary and pet professional experts, including board-certified veterinary behaviorists, Happy Paws is available on newsstands nationwide beginning today and through Meredith's Magazine Store. "Together we'll celebrate, protect and nurture that special connection we call the human-animal bond and harness the healing power of pets, bringing joy and comfort to both ends of the leash," said Fear Free founder Dr. Marty Becker. Meredith's wide range of pet coverage, featured across brands such as PEOPLE, REAL SIMPLE, Southern Living and Family Circle, is extremely popular among readers. For additional information, visit Meredith's Magazine Store. Fear Free, LLC (Fearfreehappyhomes.com) provides online and in-person education to veterinary professionals, the pet professional community and pet owners. Fear Free's mission is to prevent and alleviate fear, anxiety and stress in pets by inspiring and educating the people who care for them.